The phenomenal growth of Redmond Group over the last five years is down to the drive and talent of the people in our team. Everyone in this business is committed to the highest standards of delivery as well as first rate customer service. We set very high standards at Redmond and the people who succeed here are those who are motivated by delivering their personal best, want to progress in their careers, and can see the opportunities building an industry leading firm creates. In return we reward our employees with ongoing professional development, a range of social events, employee benefits, opportunities to volunteer and engage with local communities, and a professional and positive working environment on-site. If you’re a motivated self-starter with experience in plumbing or mechanical engineering, or someone looking for opportunities to learn on an apprenticeship scheme, please review the opportunities below and submit your CV. I JOINED REDMOND AS AN APPRENTICE AND HAVE BEEN REALLY IMPRESSED WITH THE POSITIVE TREATMENT AND EMPLOYEE CARE I’VE EXPERIENCED HERE. IT’S NICE TO KNOW ALL OUR HARD WORK IS APPRECIATED AND REWARDED WITH TRAINING, PERSONAL DEVELOPMENT AND SOCIAL EVENTS. 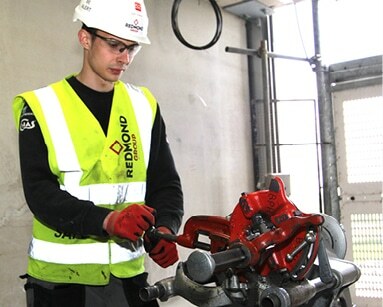 We offer Level 2 and Level 3 NVQ plumbing and heating apprenticeships. Both levels provide apprentices with on the job training and college classroom time whilst they also earn. If you are interested in applying for our apprenticeship scheme, please have a look at our current opportunities. We are looking for experienced Pipe fitters / plumbers who are familiar with large scale projects. Must have experience in press pipe systems and the ability to read and work to drawings along with high standards. Long term work opportunity, competitive rates and price work available. We are looking for a Site Administrator, this role requires some basic IT knowledge but training will be provided as required to complete these tasks. Time served electricians, with Commercial experience required. Employed or Self-employed considered.